Learn about coilgun design theory, design and implementation. We have several low-power coilguns, maglev systems and other projects. This website is my engineering notebook. Read the slides for Magnetic Launches - Hands-on Ideas 10, my presentation about coilguns on May 22, 2013. This is a quick way to see how and why it started, what happened, and where it's going. As of 2017-02-15 this website supports SSL. Let me know if you spot anything broken or just plain strange. Current projects: Click here to see my latest coilgun, my best coilgun or my levitator. Also try out my RLC Simulator and Inductor Simulator. What is a coilgun or gauss gun? It accelerates a piece of iron or steel down a tube. The tube runs through a series of electromagnetic coils (like solenoids). There are no sparks or noise or impressive side effects (or parts to wear out). Some careful timing circuits energize each coil in sequence. The principle of magnetic attraction draws the projectile along at rapidly increasing speed. Why build a coilgun? It demonstrates many basic concepts of magnetic machines. A coilgun is foremost an example of a solenoid. These appear practically everywhere, from car door locks to doorbells, from diskette drive ejectors to fuel injectors. The only difference is that most solenoids limit the range of travel, and usually have a spring return. 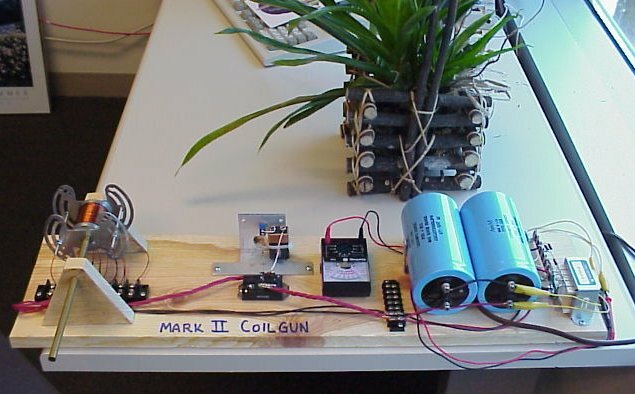 A coilgun is also an example of a simple linear motor. A coilgun is scalable to very large applications, possibly as large as a mass driver to put payloads into orbit. It's a keen space-age toy. It has no moving parts -- there's the magic of invisible forces at work. It requires no special construction techniques or unusual tools. Winding coils is fun and relaxing (at least for the first few!). Even small coils are remarkably powerful. 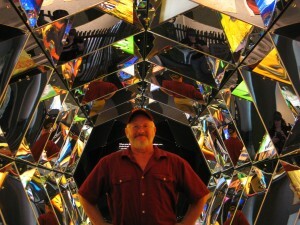 You can also learn about magnetic levitation here. These pages include complete design details for several maglev demonstrators which levitate small iron parts. Read all about it and see levitation pictures. May 22, 2013 - Added the Overview page for a quick introduction to how it started, what happened and where it's going. Check out the notes on each slide; very entertaining.